Schnell & Hancock, P.C. has a general practice, including but not limited to, business law, contracts, nonprofit law, wills, trusts, estate planning, probate law, elder law, real estate and taxation. Schnell & Hancock, P.C. 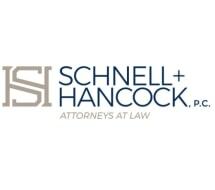 was established in September 2008 by Molly O'Meara Schnell and Melissa Hancock, and now has three attorneys. All attorneys are licensed in both Iowa and Illinois.